In order to reduce material cost and improve cycle time, consumer products companies must deal with many free surface fluid problem including, sloshing, splashing, and air entrainment. 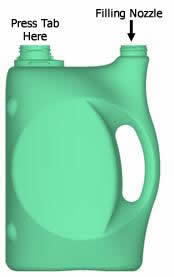 Entrained air can bulk up the volume of liquid as a container is being filled on a production line. The image on the left below shows 1.2 seconds of filling a bottle that is approximately 20 cm in height. The color shading indicates the volume fraction of air in the liquid. Because of the short time and high degree of mixing in the bottle the air has not had time to rise to the surface and escape. However, as the image on the right shows, after an additional period of about 1.7 seconds, the reduction in liquid volume resulting from air rising to the surface is clearly visible. 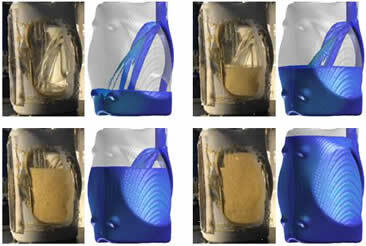 FLOW-3D‘s drift flux model allows the separation of components such as air bubbles in liquid to separate out. This article, describing how FLOW-3D was used to model the filling of a new Tide bottle design, was contributed by John McKibben – Technical Section Head, The Procter and Gamble Company. Imagine it is 9:00 in the morning and you get an urgent e-mail. We just realized that one of our new Tide® bottle designs fills onto the handle and may have an issue on our filling equipment. We don’t have any prototype bottles – and won’t for several weeks. The designers and consumers love the look of the design, but the way it fills could be a show stopper for our production facilities. When I was presented with this situation, I started responding by asking for a stereo-lithography (.stl) file of the 3D geometry (Figure 1) and I would see what I could do. I knew that FLOW-3D could use the .stl file to input the geometry and should be able to solve the free-surface problem for the filling. I expected this to give good qualitative understanding of the potential issues, but was a little uncertain about how accurate it would be for this application. About 1:00 in the afternoon, I received the geometry files, flowrates, and fluid properties. Within a few hours the simulation was up and running, delivering preliminary results. I invited my customer over to take a quick look at the results and he brought along his “boss’s boss” to take a look too. So, by 5:00 in the evening, we were looking at the preliminary results and determined that the original concern wasn’t an issue. The results did pose a few other questions however. Filling onto the handle created a lot of breakup of the incoming fluid jet. I knew this would increase the amount of entrained air and foam (we are filling laundry detergent after all). I decided to test the FLOW-3D air entrainment model. This model had been originally developed for turbulent jets, and I was uncertain how well it would perform when looking at this laminar flow problem. Experimental comparison of bottle filling model with and without the air entrainment model, courtesy of The Procter & Gamble Company. Figure 2 shows results of the bottle filling model with and without the air entrainment model. Notice that there is a significant increase in the fill level when the entrained air is included. Notice that the entrained air doesn’t force fluid out of the top of the bottle, but it is close enough that we need to confirm the air entrainment accuracy. 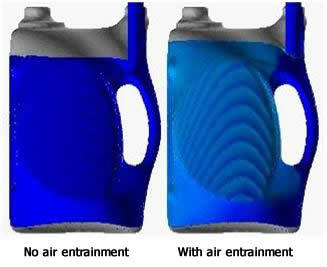 Figure 3 compares the air entrained level with images from an experiment run several weeks later (once prototype bottles were available). The qualitative agreement of the jet breakup and fill levels are excellent and provided confirmation that the simulation was sufficiently accurate to screen bottle designs.